Imagine, discovering what your true gift and life’s passion is: training with the world’s finest to perfect that craft … doing this for a living … and all while you are still only in your 20s? By most standards, that’s a wild dream. For Shawn Corbin, it’s reality. It’s funny how you sometimes casually cross paths with something that leads you to something else of life changing significance. Shawn was working at a Motorsports dealership where they sold ATVs, etc. At events, their dealership’s set-up was next to the tent of the chainsaw carving guys. As things would happen, the dealership closed, and Shaw sauntered into the world of chainsaw carving. Practicing daily in his backyard, Shawn was determined to get better and better at his craft. 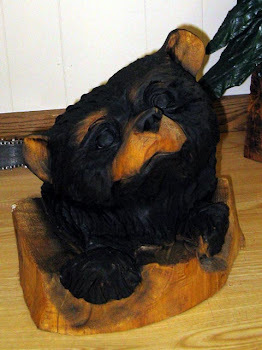 He took a four-day class in Green Bay, Wisconsin, and then did a two-year apprenticeship in Greenbay, where he learned at the feet of 25-year master carver Jamie Doeren, who himself learned at the feet of the great master carvers of Europe. Jamie hosts "The Carvapalooza" - an event near Green Bay, Wisconsin which includes international carvers. Shawn was able to attend the Ridgeway Rendevous, in Ridgeway, Pennsylvania, an annual ten-day chainsaw festival that brings in the world’s finest chainsaw artists. He was also a guest carver in Hackensack, Minnesota’s Golden Chainsaw Championships–the world championship chainsaw sculpting event. It is in places and times like these that Shawn says he learned so very, very much about his craft, as well as where he formed many a great friendship. Apparently, the elite of the chainsaw carving world is somewhat small (200) and like a family. Shawn found it a tremendous honor to be involved in these prestigious events in only his second year of carving. src360ss@hotmail.com or Phone: 763-807-3542. Visit Shawn’s website to view more of his work at: www.wix.com/src360ss/shawns-website. Shawn uses very specialized chainsaws when he sculpts. As one would guess, very specific chains, bars, and sprockets are all part of the set-up for wood sculpting. Because safety is of huge importance to Shawn, he wears chainsaw pants, gloves, and eye protection. It is notable that he has never burned out a chainsaw or cut himself with a saw while sculpting. The white pine that Shawn sculpts is bought directly from loggers, a couple thousand feet at a time. The best wood is “winter cut” because it has no bugs in it that could possibly damage your sculpture later on. Shawn charges “by design” rather than per board foot. As all sculpted pieces will eventually form a crack, Shawn has found that it is important to make sure the “heart” of the log is at the back of the carving. Shawn’s firstt cuttings are square cuts and all flat planes. At this stage of the game, he’s just trying to get all the main planes of the sculpture to line up. After that, he tinkers and refines his cuttings until he’s got the vision he wants. It is important to note that, for example, you are not carving an actual eagle. Instead, you are carving your artistic version of an eagle. For that reason, some protruding parts may be thicker than normal so as to protect those parts from being snapped off by customers as they finger the sculpture. Shawn always sharpens his chains to 20 degrees and uses corn oil, with its higher flashpoint, rather than bar oil in his saws. Once the carving is done, he burns his sculpture with either an acetylene or oxyacetylene torch. This method burns off the very top layer and makes the grain “pop”. Then, he lets the sculpture set for a week. After that, Shawn uses his most dangerous tool … a Sand-O-Flex in a 4,000 rpm drill and armed with 80 grit. The entire piece is sanded to soften all the rough edges. Sikkens oil-based wood preserver is the first coat of finish applied to his sculpture, and then whatever paints or stains are appropriate for the project. One huge thing to note is that a wood sculpture must never sit flat on the ground. It must have airflow under it so that the log can dry and not get moldy. Shawn carves quickly, only taking two and a half to three hours to carve a large eagle. He uses big saws to cut faster. The items Shawn brought in for us to see were gorgeous and not as highly priced as one might expect. Feel free to either look at his items at the store in Shakopee or contact him to buy direct. This young guy is so passionate, enthusiastic, and skilled in his craft–it just makes you want to have one of his works of art in your home. He is indeed much more than a stereotypical chainsaw carver; he is a great wood sculptor on his way to becoming a world class wood sculptor. We are lucky to have had a chance to see his work and to be inspired by his enthusiasm for his craft. Thanks Shawn for an awesome presentation and for exposing us to yet another creative avenue for working with wood.